Matt Hogge is a family nurse practitioner who practices at La Clinica Wellness Center in Medford. Family nurse practitioners are nurses with advanced training who, like physicians, provide primary care services for patients. 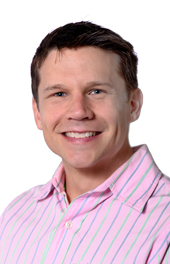 Matt holds a nursing degree and a doctor of nursing practice degree from the University of Portland. He also holds a biochemistry degree from Southern Oregon University in Ashland. He minored in Spanish while there and enjoys practicing his language skills. He is a former emergency room nurse for Providence Medford Medical Center and completed clinical rotations at La Clinica health centers while still in school. A native of Medford, Matt worked as a rafting guide around the northwest for many years before embarking on a career as an analytical chemist in the Bay area. After deciding that working in a lab was not for him, he joined the medical field and moved back to the Rogue Valley. He and his wife have two children and live in Ashland. He enjoys whitewater kayaking, playing soccer, running, mountain biking, gardening, traveling, and generally having a good time. La Clinica’s work drew him to the organization.